"Pa gen nèg k ap regle afè pèp vre!" The opposition in Haiti is not at all looking out for the best interest of the people, Haitian journalist Guerrier Henri said in his radio show 'Boukante La Pawol', It's just a game they are playing. Tension is in the air in Haiti, What will happen 17 Octobre 2018? 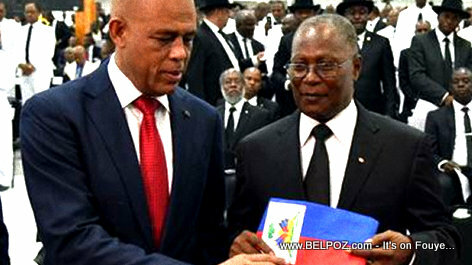 Guerrier Henri recalls, everyone in the opposition wanted to set the country on fire when ex president Michel Martelly and prime minister Evans Paul attempted to elect a new president back in 2016. Jocelerme Privert and the opposition put their heads together and split the "pouvoir" like a pie (yo se pare gato, neg yo separe pouvwa a). "During that separation of power, everyone kept their mouth shut, there was NO opposition, there was NOTHING," Journalist Guerrier Henri said. "Even those who were in the streets, with Privert, they were confortable. Everyone was handling their business." As soon as President Privert left office and Jovenel Moise became president, the opposition was right back in action. "It's a game!" the journalist exclaimed.